The first time I ever travelled to Khabarovsk and Vladivostok was five years ago in the winter of January 2009, the last legs of a Trans-Siberian journey that also took in Yekaterinburg, Irkutsk, Lake Baikal and Ulan-Ude. The winter wasn’t particularly vicious but I sure as hell felt the cold, and endless days of snow and ice meant that while I could see the cities and talk to people, any underlying beauty remained hidden. This time I was hoping to see both cities in full bloom, and despite some rain I got to see just that. Both cities would probably consider themselves the big dog in the far eastern yard and I wanted to try and get a better idea of whether that manifests itself in everyday life. 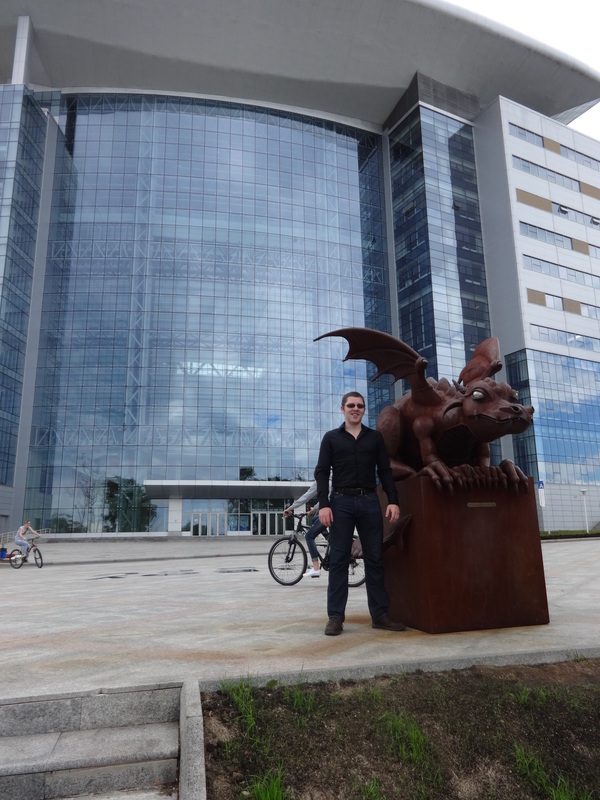 My first stop was Khabarovsk, fresh from another red-eye flight out of Yakutsk. The airport greets you with a message telling you that it’s the capital of the Far East, a not-so-subtle reminder to anyone who was ever in any doubt. A cheap ride on the trolleybus later and I’m set up in my flat and ready to explore the city. At least, that’s what I thought. It turns out I’m not immune to jet-lag; jumping numerous time zones and taking several flights over the space of a few weeks was catching up with me. After closing my eyes for ‘forty winks’ I woke up several hours later and the day was mostly gone. Given I was only going to be in Khabarovsk for a few days I kicked myself for not being able to stay awake. However the lesson is always have a ‘Plan B’, and I set off for a shorter walk through a few of the parks. I already knew a Korean-Russian girl called Ola before I arrived, and she met me for a walk and afterwards a beer. I wanted to ask about life in the east, but it seemed like I was the one being interviewed at first, with the conversation revolving around what I thought about other cities in Russian, and whether I noticed any difference in dialect and accent between Khabarovsk and Moscow. For the record I’m honest enough to admit I’m not good enough at the language to detect any subtle differences, but at a basic level there’s little or no difference to my ears. Eventually I get the conversation back towards the east, and Ola tells me about her thoughts on Khabarovsk. She likes it, it’s her home city, she’s very proud of it. But as with so many, there’s always a ‘but’…Ola wouldn’t mind living elsewhere, preferably in southern parts of Europe. The climate is terrible, and she has dreams to fulfil with her boyfriend. I ask about her the development of the region, is it making a difference to life there for the average citizen? She thinks certain things have improved, but the important things aren’t; housing is still a problem, both in costs and availability. Wages aren’t high enough for the cost of living out east, and variety in opportunities is lacking. The politics and management of the development are out of people’s reach, and there’s a resigned tone to her voice. I push a little deeper, I ask her if she likes Vladivostok, if there’s really a rivalry between the two, but she’s not really interested in any rivalry. She prefers Khabarovsk; even Vladivostok is too far away to inspire a competitive instinct. I let the conversation drift again briefly, but the night is young and soon enough I would get a chance to talk to her boyfriend Roberto about life in Khabarovsk. Roberto isn’t ethnically Russian either, he’s a Serb who moved out east after he met Ola, and he ended up going to the local university for a few years. He’s the outsider on the inside, and he tells me about his life in the city. He gives the almost mandatory complaint about the climate, saying he prefers to be elsewhere when the snow and ice arrive. He loves his homeland but after enduring the east for years to be with Ola he’d be happy with anywhere in Southern Europe as well. Perhaps I shouldn’t be surprised that his answers began to resemble Ola’s, long-term couples often agree on these things. I let the beer kick in a bit more and turn to entertainment in the city; he tells me that not much happens out east, it’s not a popular spot for music and famous performances. He nods at the beer and the pub around us, smiles, and says drinking is a local pastime when there’s nothing else to do. We raise a toast to that and I turn off my interview mode and enjoy the rest of the evening. I meet Roberto again the next day and we head for a trip to the museum of regional history. I had somehow missed it the first time I was in the city and I was interested to see how deep it went into the earliest history of Khabarovsk. It’s empty aside from the staff, which in Russia I usually take as a good sign of the content. Some of the history is well-known to me, of Nikolay Nikolayevich Muravyev-Amurskiy, its founding as Khabarovka, early conditions and the strategic value beside China. They even had a small display about the disastrous Khetagurova campaign to populate the east so props to them on that front. 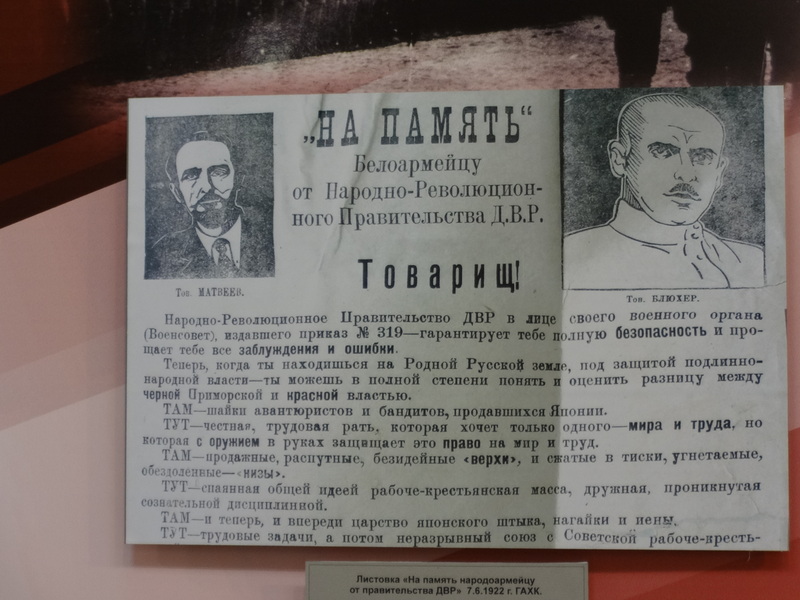 There’s a great collection of posters and documents throughout the various rooms, and I’ve now got over a dozen pictures which I need to work on translating. In the second room we get talking to the middle-aged lady who keeps an eye on things from her seat. 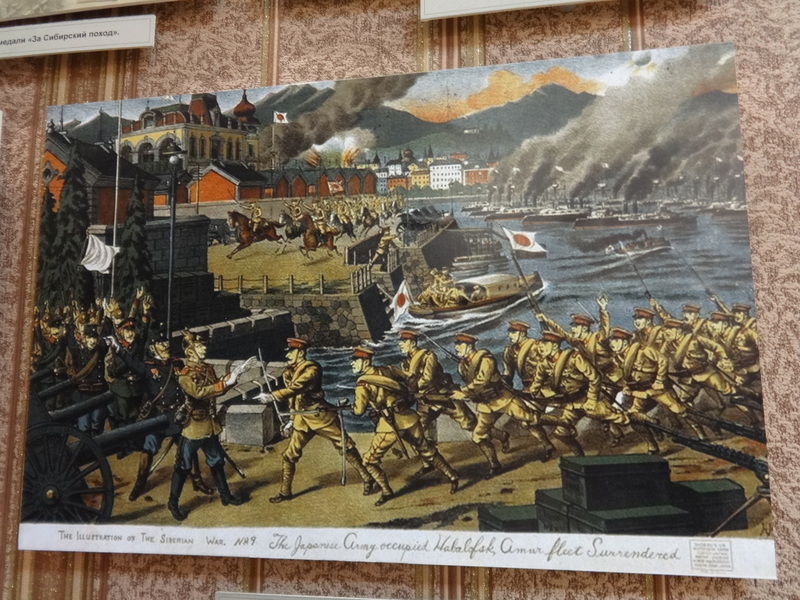 She’s passionate about local history, and she tells us more about the Japanese and Allied presence in the Far East and Siberia during the Russian Civil War. She’s impressed that a Scotsman would go all the way to Khabarovsk for more than just Trans-Siberian tourism, and jokes about a Scot and a Serb being the only two visitors of the day; she assures us however that it’s usually busy with Russians. We talk modern events, and she’s happy living her life in Khabarovsk. She sounds hopeful on the future, and that since the city has an interesting past, it can also have an interesting future. There’s a hint of ‘love is all you need’ about her outlook, but I’m happy to hear some real positivity. Sometimes it’s easy to drift into resignation instead of doing something positive. I talk to Roberto about sport afterwards, and ask him if he’s found a place in his heart for SKA-Energiya Khabarovsk, or Amur Khabarovsk. He looks a bit sheepish and says he’s not really interested in them, and that in general people in the city only get interested in the teams when they’re doing well. The worldwide phenomenon of choosing a Spanish, German, Italian or English team instead has crept up even in this corner of Russia. Individual sports are more popular, though it’s hard to say if any one individual sport is more popular than the rest. At this point we meet Ola again, and I need to offer a huge amount of thanks to her for what happened next; I had wanted to get a scarf of SKA-Energiya, but with the season over it was nigh-on impossible. Just when prospects looked bleak, she made a phone call, and that someone made another phone call…well it only turned out that they knew the managing director of the club, who had a brand new scarf sent over for me free of charge. A great gesture and one I’m extremely grateful for. Later that day Ola introduces me to Vladimir, a Siberian lad who has made Khabarovsk his home and who knows a lot about local history. Given that most people aren’t too interested in the topic I’m looking forward to talking more with him. We discuss the progress of Khabarovsk over the years, and the conversation drifts towards the modern era. Despite not being born and bred in Khabarovsk, Vladimir has come to enjoy the city. He’s lived and worked across the country, served in the military for a while, and settled down with another Korean-Russian girl from the city. He says Khabarovsk is definitely a better place to live than Vladivostok, and he wishes more people would stay to try and improve the region. Given the cold nature of his own home city he doesn’t get scared off by cold winters here, he just grins and bears it. As with almost everyone else he wonders why the hell I’d be interested in researching the Russian Far East, but respects the fact that I’m giving it a go. We talk a lot more as the evening draws on, but with the beer flowing some of the details of our conversation by then drift from memory. As we walk the street during the evening I realise how good this city is for a pedestrian as compared with other Russian cities; wide pavements, well-maintained and generally in full repair, combined with decent-looking buildings and efficient services. It’s a refreshing sight, and something that the local authorities and planners in other cities should learn from. My final day in the city was a bit more pedestrian, but it picked up near the end; I finally got around to eating some dogs. I have to thank Ola again, (if you need something done in Khabarovsk, talk to a Korean!) 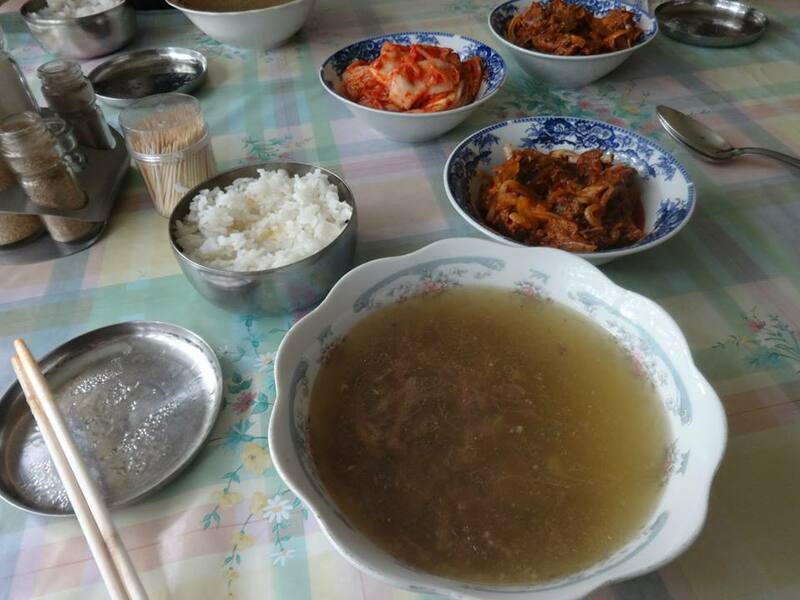 she was able to find an unregistered restaurant who served the dish, and an interesting meal was had. (Apparently there are three in the city, though I’ve no idea where the dogs come from) Afterwards I got a lift to the train station from the owner of the flat I had stayed in, and I talked to her a bit more about the city. Much like Vladimir she was happy here; she operated a number of small businesses and appeared to have a successful job on top of it all. She lamented the quality of Russian goods, and one look at her car and the contents inside told you that Japanese and Korean products were preferred. She felt that the development of the region wasn’t resulting in many changes on the ground for ordinary people, and she was concerned about whether things would ever really change. Once again there was a hope and desire for improvement, but a sense of resignation that there was little she could do individually to make a difference. As we reached the station I repeated the question I had given to others, and asked her about Vladivostok; Khabarovsk was better, but she didn’t really see it as a rivalry. Khabarovsk happened to be more professional whereas Vladivostok was dirtier and less organised. In the end they were all Russian though, and both cities just happened to be close to each other. 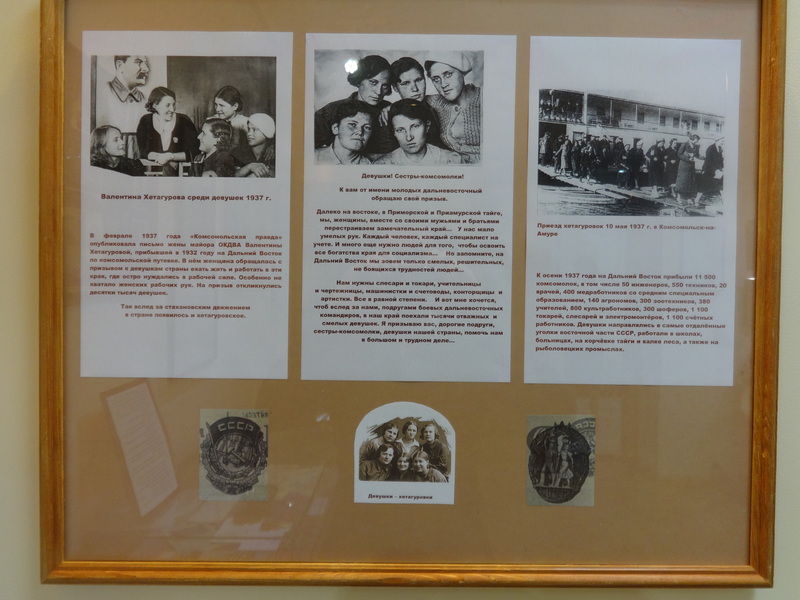 An interesting perspective, and at that we said our goodbyes as I headed to Vladivostok on the overnight train. The sun was already shining bright as the train pulled into Vladivostok station, and it inspired me to take the walk to where I was staying. It was a move I almost regretted, lugging my case uphill virtually all the way for about 3km, then again up several flights of stairs. Compared to Khabarovsk the city is a logistical nightmare, with houses and buildings strewn across a wide area. 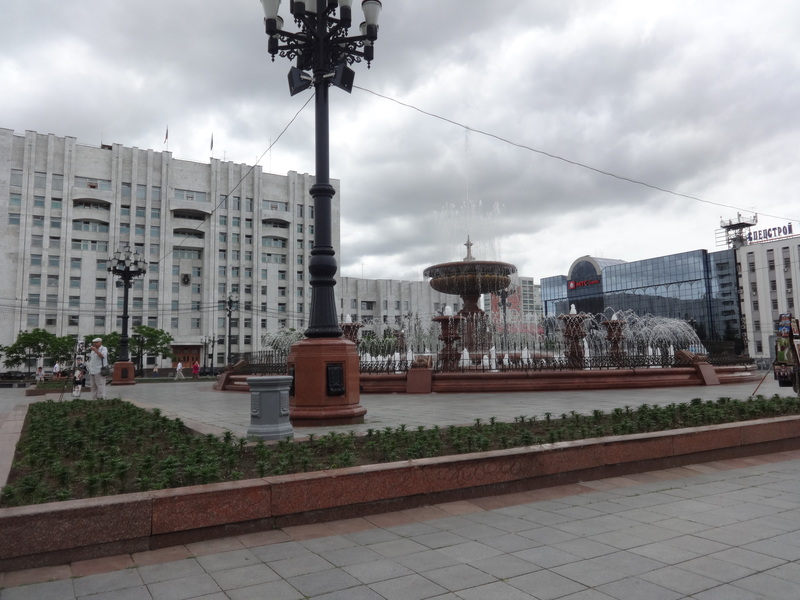 The main difference I noticed right away is that Vladivostok looks very similar to the way it did five years ago, from the Lenin statue opposite the station right down to the roads and pavements off the main streets that are often in need of solid repairs. 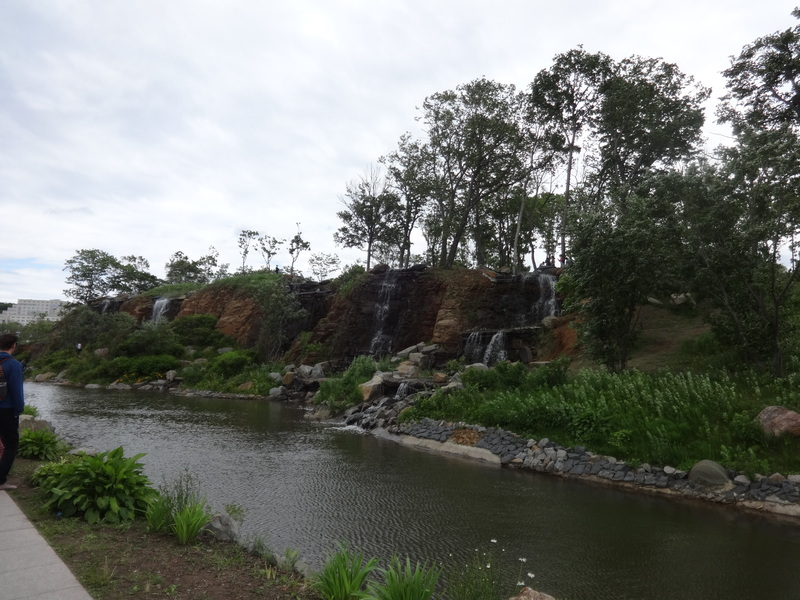 I’ve heard it said that it adds to the charm of the city, but they don’t have many excuses for letting things get to this stage, especially with the drive to modernise the city structures during the 2012 APEC conference. Nevertheless the two bridges constructed as part of those preparations loom large in the skyline and are an imposing feature of the landscape. I was staying with a Korean-Russian for the first night of my stay, and we got to talking before she had to go to work. Olga works in the medical tourism industry for a South Korean company, and for those of you who don’t already know South Korean companies are aiming for growth in the Russian market, with rising success in a short period of time. She was born in the Primorskiy region and has lived in some cities abroad, but despite her time away she still loves her city and enjoys living there. I told her my first impressions of the city and asked her how she would compare Vladivostok to Khabarovsk; her response was far more favourable to Vladivostok, saying that it had more culture and events happening. She admitted the place could be tidied up and repaired, but didn’t worry too much about it. I moved on to the APEC legacy, and posed that the bridge was obvious but had anything else changed? Again she seemed positive, but couldn’t really specify anything else significant that had occurred, and after a while mentioned the Russkiy Island developments for use by the Far Eastern Federal University. I didn’t press on the issue, but I got the impression that whilst obvious changes weren’t easy to point out, there may well have been a boost in morale amongst the city, a positive outlook pushing through amidst several years of pessimism as shown by Olga’s feeling that things were on the up. After our chat I took a walk along the main square and down to the docks to see the fleet. 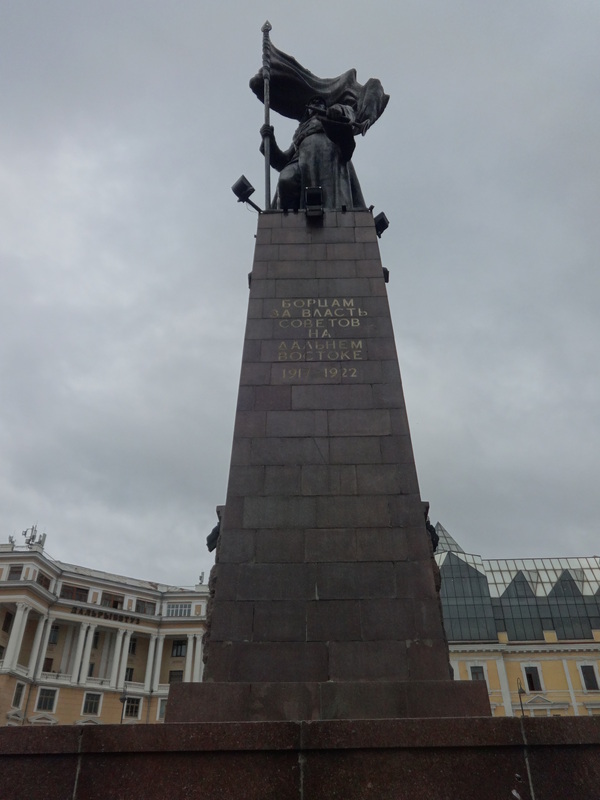 If there’s one thing that definitely hasn’t changed, it’s the prominent presence of the monuments on the main square, celebrating the partisans who defended the revolution in the east and brought the Far Eastern Republic back into the fold once the Whites and foreign forces were pushed out. They’re huge and dominate the street, though the image is lessened slightly when you see donkey rides and children hiring out electric bikes around the square. Further on at the dock area there’s some work being done, though the submarine museum is still there, and the fleet still looks imposing. For lunch I fancied a game of bilyard, but it was hard to find a decent place. I settled on a dinghy looking rock bar that showed some potential, and even though there was no bilyard table I got talking to a guy at the bar who told me his thoughts on the city. Unfortunately I forget his name, but he was a musician (it’s a rock bar!) who trained at university. He was a bit more pessimistic about the economic direction of the region and felt that there was a lack of opportunity to get a solid career. I asked if he thought about setting up his own business since he had ideas, but he complained of too much paperwork and regulation. At this point I should admit I felt a bit unsympathetic, here he was in a bar at lunchtime complaining about not finding good work, however he moved on to cultural life in the city and things picked up a bit. He told me that despite his previous pessimism he still loved the city dearly, and had more regional pride than he did national pride; Vladivostok first, Russia second. I expected him to be opposed to Putin and United Russia at this point, but he was relatively happy with them, it was simply a mentality he said existed in the east. He spoke of the creativity in the city, the tendency to be different, and that Khabarovsk by comparison was a dull and sterile place. He suspected they were in greater favour with the federal government, and would never move there. He became more wistful of his future musical dreams at this point, but I shared a drink with him before heading back out into the city. It never fails to amuse me that Vladivostok has a series of beaches; yes it’s by the sea but the water always looks dirty and the weather is only occasionally inviting for ‘taps aff’ sunbathing. 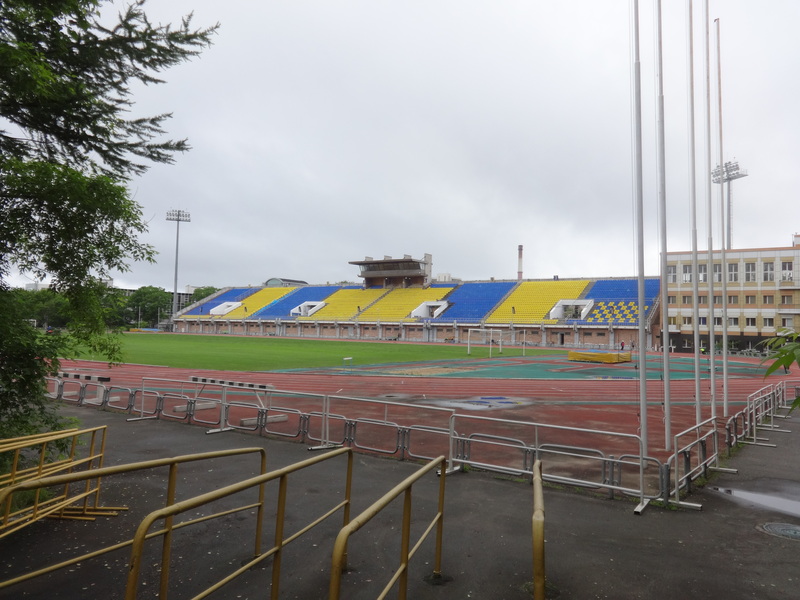 However I ventured on down to the beach anyways with the consolation in my mind of taking a wee look at the stadium of Luch-Energiya. I hate to be critical but it felt a bit soulless again, the highlight being a fountain that sprayed its water in tune with piped music. Songs by ‘Busted’ and dance remixes of Celine Dion’s song from ‘Titanic’ just don’t work for me I’m afraid, and it looked like they didn’t quite work for the sparse crowd either. There are some factors that the city can’t control when it comes to their beaches, but the public entertainment can surely improve. After the trek to the beach I met up with another local called Anna, this time a twenty-something PR worker who was born and raised in the Primorskiy region. She had been to Khabarovsk and a couple of other cities, and even lived in Komsomolsk-Na-Amure, but for her Vladivostok was better than the rest. It seemed to be a theme amongst the natives, there’s a definite feeling of pride no matter how good or bad things are. Like my first host she struggled to think of any visible changes beyond bridges and other infrastructure development, and after thinking about it she raised some exasperation at how money was spent and decisions reached in the region. She told me that although there was development in some sense, it was not a development that was benefiting ordinary people, and was primarily for the political and business elites to benefit further from foreign investment and domestic kickbacks. Housing was a big complaint, with tales of high costs and limited availability. Things were so bad that even as a full-time worker with a university education, she was staying in shared accommodation akin to a dorm in order to save money. 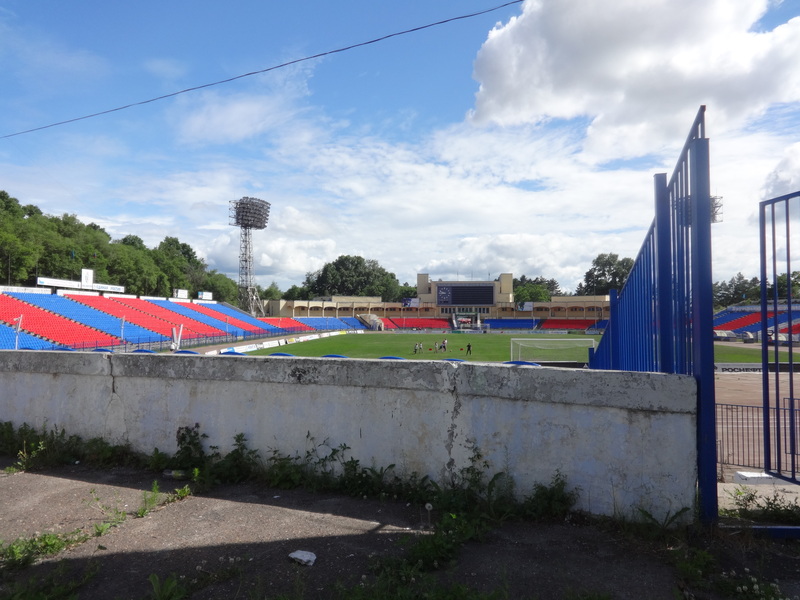 I asked if such circumstances meant she would be looking to move elsewhere, but aside from the dream of a trip to Manchester to watch some football, she was content staying in Primorsky. A very tasty Armenian and Azeri style dinner later and I was spent for the day, but I still had time for one more brief chat with a local PhD student who was working on Korean history. Her experience mirrored that of the rest, a strong local pride, a concern about opportunities and costs, and a desire to see the region fulfil its potential. My second day in the city turned to more academic matters when I met up with a local professor and PhD student to talk all matters Russian Far East. I won’t go into too much detail on all their views as they were numerous and detailed, but it was good to have the opportunity to sit and talk away about the region, a situation that unfortunately doesn’t arise too often back in Scotland. 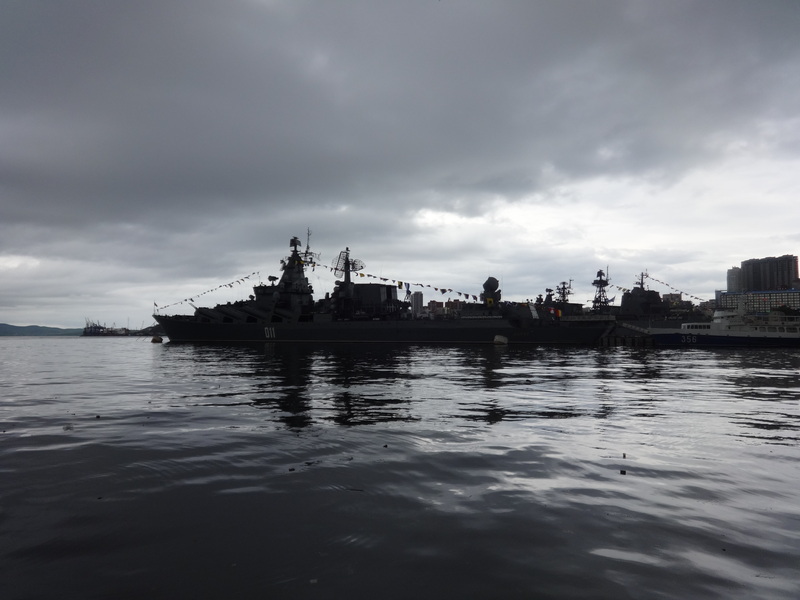 I got the impression that even in Russia specifics about the development of the Russian Far East aren’t too common, with more focus on Russian relations with Asian countries. We agreed that whether Russia will remain focused on Korea, China, Japan and India, or whether their relations start reaching out more towards Indonesia, Singapore, Malaysia, Philippines and other South-East Asian nations, will be very interesting in future. I spoke about my desire to spend more time in the Far Eastern regions, whether to learn Russian language, carry out fieldwork or both, and it’s something I’ll be following up in the weeks and months ahead. After dinner I was given a tour of the campus on Russkiy Island, and I have to say it looks better than any other facility I’ve seen in Russia. 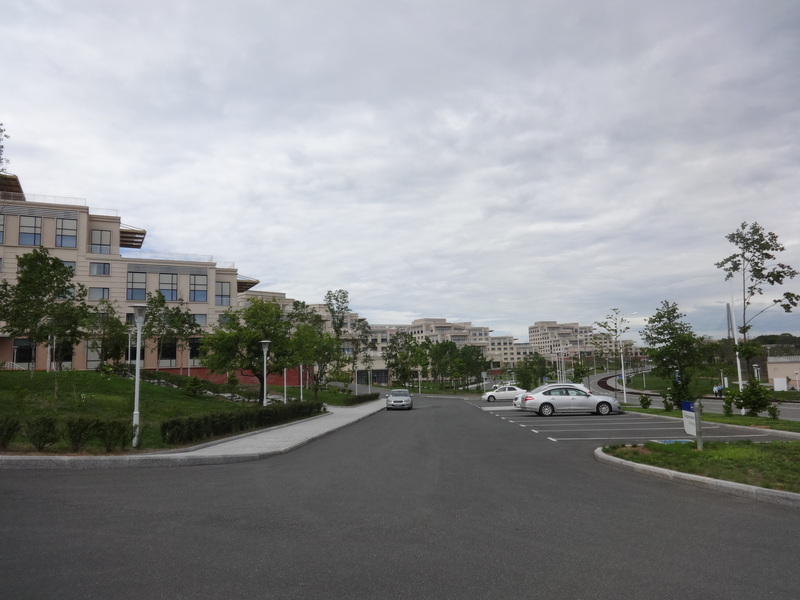 It was of course designed to host the APEC conference and house the attendees, but the fact it’s being put to good use is a positive sign for the city. Combine that with the gorgeous scenery all around the island and you have a great environment for students in the years ahead. Russia could do with a lot more construction and development in the university sector, especially if it wants to attract paying students from other countries such as Korea and China. The rest of my time in the city was devoted to more walking and sightseeing, with the highlight a trip to the top of Sparrow Hills to look out over the bay. You can see the panorama picture below this paragraph, but if you ever make it to the city you should climb up and take a look out there for yourself. (If you’re not up to walking the funicular can take you up) On that note I also noticed by the end of my stay that I’ve been losing some body fat, despite indulging my taste buds on a few occasions out here. I guess keeping up my workouts, walking at least 10km a day and a few beers here and there is a great way to keep in shape! 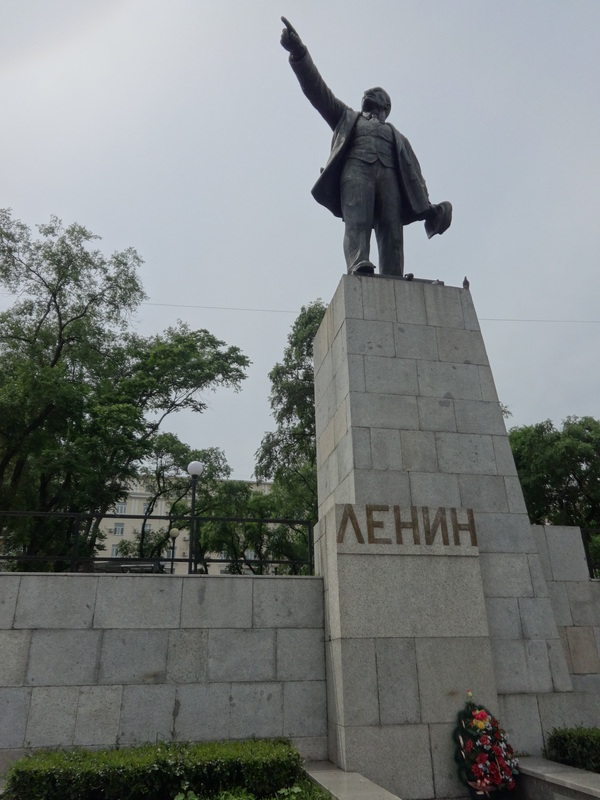 As a bonus to this article on Khabarovsk and Vladivostok, I spent half a day in Artem. I didn’t go out exploring the town, instead heading straight for the hostel before an early flight the next day, but it was a really depressing sight from what I did see. I don’t know if I just happened to see all the bad parts, but from exiting the train station, getting a taxi to the hostel, and taking a look around the area at the streets and buildings, everything and everyone just looks utterly depressed. Even the taxi driver said the place was dire. The cafe worker at the hostel couldn’t think of anything nice to say about the town. If that’s the state of affairs across all of the second tier towns and cities of Eastern Russia, it’s going to need more than a wee bit of development to sort out. However when it comes to Khabarovsk and Vladivostok, there are definitely some differences between the two cities, whether it’s the architecture, the industries and prospects, regional pride with Vladivostok more competitive towards Khabarovsk than vice versa, and expectations for the future. I think both of them can still make something of themselves, and probably they’re the only two real contenders to develop serious urban hubs in the Russian Far East, but it’s still going to take some work. People from the west don’t want to go there, and those from the east want to stay but can’t always do so due to limited opportunities. Fresh ideas are needed from those with the ability to implement change, but I’m pessimistic about it in the immediate future. Next up is Yuzhno-Sakhalinsk, where the weather has been hurricane-esque. Hopefully all will be well when I arrive, but rest assured I’ll let you know my thoughts on the city sooner rather than later. This entry was tagged Artem, Khabarovsk, Russia, Russian Far East, Russkiy Island, Vladivostok. Bookmark the permalink.